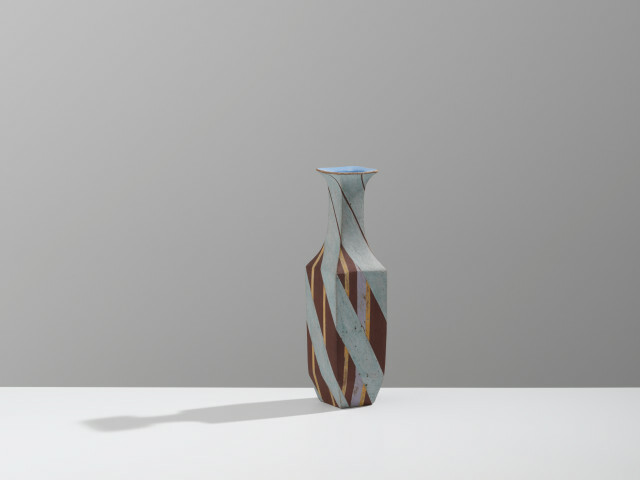 Elizabeth Fritsch (born 1940) is one of the most prominent British hand-builders of her generation, one who created a new aesthetic of sculptural vessel forms and geometric decoration. He pots have ranged from quiet comparatively austere pieces to more complex shapes and marking, the colours often vivid and luminous. She has a painter’s sense of brush and surface (reminiscent of early Renaissance frescos), and a keen architectural eye for contour and silhouette. Her forms - which include cups, jugs, vases and bottles - have a largely symbolic function, and are cut and altered to create interesting structural deviations with leans and ellipses which takes her work in and out of symmetry. Her geommetries often relate to her deep interest in music and its rhythms, and her wider appreciation of the natural and human-made environment. Fritsch, who is based in London, attended the Royal College of Music before studying ceramics at the Royal College of Art from 1968-71.